Hello lovelies, a bit of a new one on Mummy Monday feature this week, I thought for all the other mummy's out there and daddy's of-course I would share my experience with nappies and which ones I found the best and nappies I would never repurchase again. Obviously everyone's experience is different and my little man drinks a hell of a lot and fills his nappy very easily but I think some brands should not have on the front super dry because it is a massive fail. The prices below are for nappies of a size 5/6 as that is what size Oscar is currently and the standard packet size. Aldi - Mamia Ultra dry £4.49 - By far the best ones we have had and the cheapest! They look really comfy on him and snug, they keep him dry all night and he is a very good sleeper from 7pm till 8am! They have even won awards for being the best nappy and for dryness. No leaks, soft, high and he loves the little animals on there aha. Tesco - Loves baby ultra dry £5.97 - If were in Tesco's and nearly out of nappies we pick some up, Aldi are like our top nappies but these come in second best only slightly, again great at keeping him dry at night time, comfy and very soft great if your child has sensitive skin and they always have good offers such as two packets for £10 and they have a great amount of stretch in them for baby's on the move. Asda - Little angels comfort dry £5.97 - Asda nappies usually have great offers too such as two for £10, we don't go to Asda a lot as there isn't one in out town and it's just easier for us to get ones locally but when we have been out and had these nappies they have been great! They leave no leaks, soft and there quite high up for when they do those nasty number two's all up there back, you know what I'm on about parents, yack! Brilliant value and great also for little ones on the move. Pampers - Simply dry £5.60 - I think people who are new to parenting believe Pampers are the best or the most expensive nappies are the best and I think they couldn't be more wrong. Not always the most expensive of things always work out to be the best. This is a price based from Asda I know Pamper's nappies range in price wherever you buy them from.What gets me is this particular nappy claims to have an extra dry layer and protective leak cuffs? Well Oscar always leaks in these and is really wet by morning once he has slept in them, I actually gave away pretty much a whole packet after trying them for a few days so we will never be repurchasing those again, but like I said before every one has different experiences and Oscar also had rashes from these nappies. Morrisons - Little big comfy dry £5.89 - Sorry I completely forgot to put these in the little collage above but these nappies are like paper thin, they don't last more than a couple of hours without leaking through, again we gave these away after persevering but had no luck with them. Boots - Super dry extra absorbent £4.99 - Not extra absorbent at all, soaked his sheets after the first night of using these and again don't last longer than two hours in the day. I had high hopes after the woman said she used these with her children and found them great, when your a new mum you will try anything! 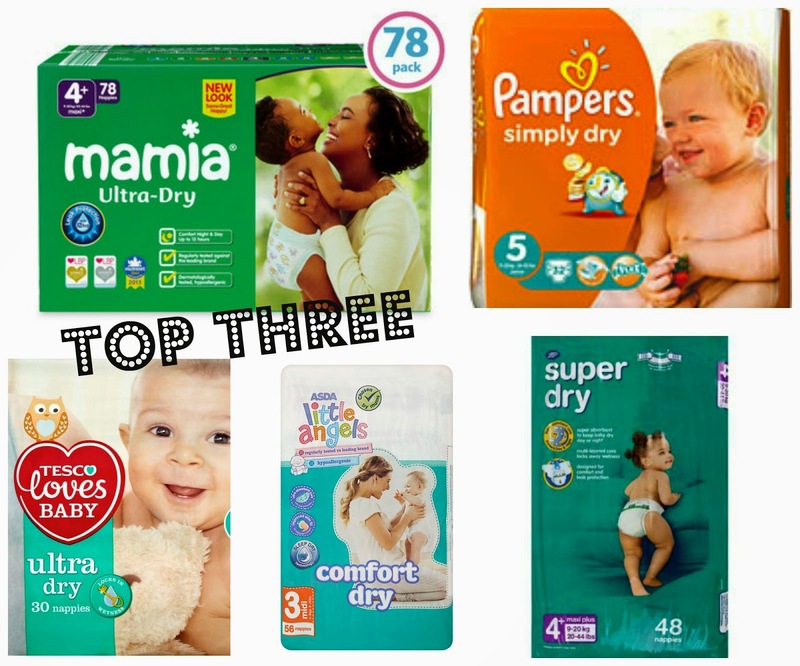 After searching high and low for the best nappies you want to try every shop and brand going but these didn't work for us at all unluckily. Everyone has there own favorite though and works with whats best for them. I'm an Aldi fan too. When I had my first, I picked up a few different brands to make sure I had some ready & to try them all out. Absolutely hated Tesco & Boots brands, they weren't worth putting them on. Sainsburys have also been good for us, if I'm out of Aldi, I'll always grab some of theirs. A great amount of chemicals are being used during the process of manufacturing these disposable nappies. MUMMY MONDAY | WHAT'S INSIDE LITTLE MANS DAY BAG?